You know that Andy Warhol saying, ”In the future, everyone will be world-famous for 15 minutes”? Well, for me, the future arrived this week. 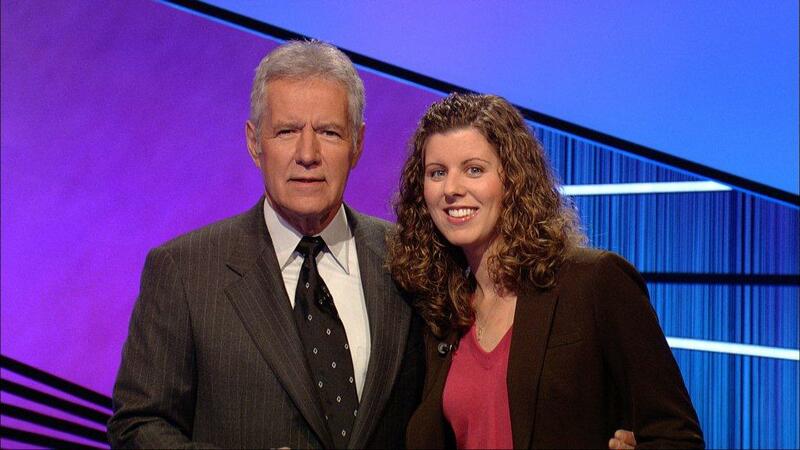 And my fame actually lasted for 22 minutes of air time, because I was a contestant on Jeopardy! Don’t believe me? I have proof! This whole crazy experience started back in 2010, when Robby learned that Jeopardy was holding its annual online qualifying test. We both took the test, and a few weeks later I got a phone call. 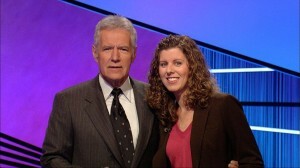 It was a Jeopardy producer, telling me that I had passed the test and inviting me to a live audition! The audition was held in a hotel ballroom in LA. There were about 75 people there, and we ran through a bunch of practice tests, mock trivia rounds, and anecdote-telling sessions. Totally nerve-wracking! I didn’t think I had done very well, until a few weeks later when I got another phone call asking me to be an alternate on the show in September 2010. (They always have a local contestant stand in as an alternate in case one of the players drops out). I didn’t get picked to compete on the show in 2010, but I did get to spend the whole day on the Sony Pictures set. I watched the taping of 5 episodes of Jeopardy, and got to eat lunch in the Sony cafeteria. The highlight of the day was spotting Tobey Maguire a few tables over–not that I knew it was him until someone else pointed it out! I’m not very good at recognizing celebrities. After the long day of taping, the producers told me that they would keep my name on file for 18 months and call me if they had an opening on the show for me…and that was the end of that, or so I thought! I went on about my life until I got another surprise phone call in February 2012. This time, the producers told me they had an opening and asked me to come in for a taping in March. I immediately called Robby and freaked out…and then I called my hairstylist to get my hair looking presentable for TV. Robby spent the next month trying to get me to practice my clicker skills, and I tried really hard not to think about the fact that I could potentially humiliate myself on national television. I thought about studying, but wasn’t even sure where to start, especially since I had so much actual studying to do for my MBA classes. In the end, I memorized the names of the first 10 English monarchs and looked at some lists of classic literature titles, but that was it. The day of the taping, Robby and I woke up at the crack of dawn and headed out to Culver City. We were almost late because of the traffic, but he got us there just in time! While Robby met up with my mom and sister and waited in the guest area, I spent a few hours playing practice rounds with the other contestants, doing sound checks, perfecting my anecdotes, and letting the makeup lady plaster me in super-thick, super-dark makeup (ick!). And then, the taping began…I watched the first round, and then the producer called me over and told me I was up next! I chatted with my competitors–Blythe, an attorney from Washington, DC, and Dan, a theology teacher from Chicago–while the sound guys hooked up my microphone and the makeup artist dusted my face with a bunch of powder. Suddenly, Johnny Gilbert’s voice was booming across the stage with the words, “This…is…JEOPARDY!” and the game was on. I was so nervous that I almost threw up, but I forced myself to focus on the clue board and my clicker. Once the game got moving, it felt like everything just became a blur. I remember talking to Alex (my anecdote was about how I met Robby…and about how I knew he was the one for me when I found out he catalogs his own books!). I remember how relieved I felt when I answered my first question correctly, and I remember that I was in the lead at the end of the first round. Double Jeopardy was kind of a blur, and I wasn’t ringing in fast enough to build up any cash. So, I ended up in third place, with $8,200 going into Final Jeopardy. The category was announced as “First Names”…not very specific. My dad and I have had all kinds of debates about final wagering strategies over our years of watching Jeopardy together, and his philosophy of “go big or go home” kept running through my head. I also heard Robby’s voice in my head telling me that he loved me and would be proud of me even if I lost everything. And so, I decided to do something crazy and bet it all! I entered my $8,200 bet and waited for Alex to read the final clue. The clue was: “A wife of King David & 2 of our early first ladies shared this name derived from Hebrew for ‘my father’s joy’.” As soon as I read the clue, I got excited. I knew the answer!! My in-laws and I had read through a Beth Moore Bible study on David two years ago, and it included a story about David’s wife Abigail. I also thought of Abigail Adams, and the Hebrew word “Abba,” or father. The famous Jeopardy music started to play, and I quickly wrote down my answer. Since I was in third place, my answer was revealed first. Alex confirmed that I was right, and for a moment, I was winning with $16,200. Yay! Unfortunately, even though I doubled my money, it still wasn’t enough to beat Blythe and Dan since both of them got the answer correct. Dan ended up winning, while Blythe pulled ahead of my by $3,600 to take second place. And just like that, it was all over. My microphone was unhooked, I signed the prize form (as the 3rd-place finisher, I only got to keep $1,000 of my winnings, boo! ), and then I ran to meet my family outside. We did some hugging and some excited squealing, and then we headed back to Pasadena for lunch. The episode finally aired yesterday, and ever since then I’ve been inundated with calls, text messages, Facebook posts, and emails from friends and family. And also from a few complete strangers who found my work phone number/email through Google, which is a bit creepy…good thing I have pepper spray and campus security guards nearby, just in case! The set looked exactly like I expected it to from watching on TV, but the audience area was smaller than I thought it would be. Getting the buzzer timing right is really hard! You have to wait until a light goes off, and if you buzz in too quickly, you’re locked out for half a second. Watching yourself on TV is excruciating…especially when you look like an Oompa-Loompa thanks to a ton of dark makeup. Everyone I met was so nice! It was fun getting to chat with the other contestants and hear their stories. And the producers were hilarious. My TV career is over–I have no desire to do anything like this again, although I do plan to play lots of bar trivia with Robby! Thanks for the details on your experience Kim! I had it written down in my brain to catch your episode, and then things got busy with the girls and the next thing I know it’s the following evening when I realize I missed it. I am truly impressed that you had the opportunity- there is only a very small percentage of the population smart enough! Sorry about the money, that would have been icing on the cake.